ON THIS PAGE: You will find drawings of the main body parts affected by CLL. Use the menu to see other pages. This illustration of the lymphatic system shows the lymphatic vessels, which are thin tubes that branch out to all parts of the body. It also shows the spleen, located on the left side of the body under the liver, and the thymus, located behind the breastbone. 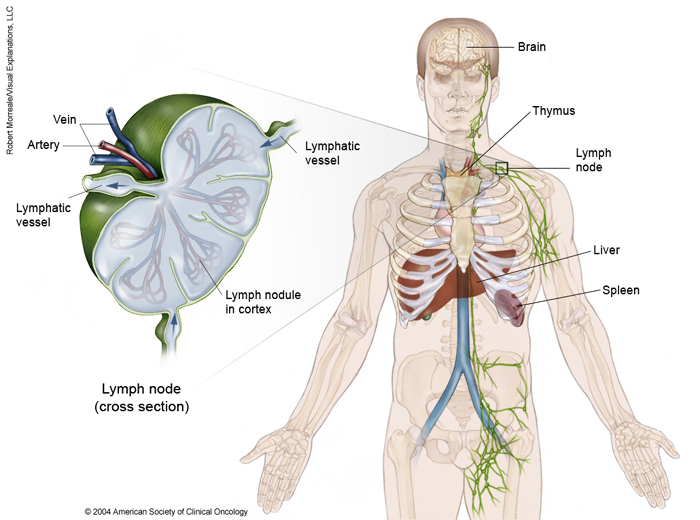 Groups of lymph nodes, tiny bean-shaped organs, are located throughout the body at different areas in the lymphatic system. The largest groups of lymph nodes are shown in the abdomen, groin, pelvis, underarms, and neck. A cross section of a lymph node shows that veins, arteries, and lymphatic vessels allow blood and lymph to flow through a system of lymph nodules in the cortex of the lymph node. Copyright 2004 American Society of Clinical Oncology. Robert Morreale/Visual Explanations, LLC. 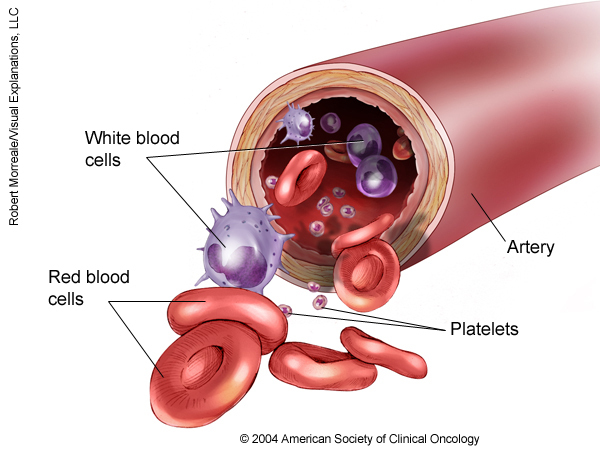 This illustration of an artery shows various types of blood cells, including the flat red blood cells, multiple types of white blood cells, and the much smaller platelets. Copyright 2004 American Society of Clinical Oncology. Robert Morreale/Visual Explanations, LLC. The next section in this guide is Risk Factors. It explains the factors that may increase the chance of developing CLL. Use the menu to choose a different section to read in this guide.